If you live in the Georgia 9th Congressional District, then no doubt you have received a negative ad in some form about competitor Martha Zoller sent by the Collins campaign. Collins, supported by Governor Deal and other district heavy hitters, must be really concerned about his too-close-for-comfort primary finish, because the campaign came out of the narrow victory into the runoff swinging. While not advancing any particular candidate, Lanier Tea Party “Coordinator” Mike Scupin sent out an email to all those on the Tea Party mailing list to “bring light to false information that has been distributed by [Collins. ]” Scupin then goes point-by-point dispelling each statement made in recent mailers. The complete email can be found here: 5 out 5 Pinochios for Doug Collins Campaign. Until Republicans overtook the House in 1994, most Georgians were Democrats and Doug and Martha were right there with them. Governor Deal did not switch parties until April 10, 1995. Until then almost everyone who was anyone in North Georgia was a Democrat. In addition, it is not uncommon for people to be more “liberal” in their youth and conservative when they mature. The real issue for voters is whether a person is a Real Republican or a RINO (Republican in Name Only) who is a liberal posing as a Republican. I was hoping that after the primary we would hear something about the platform, dreams, and goals of the candidates, not more negativism. We haven’t yet. Time to stop. Kudos to Mike Scupin for taking the time to analyze the allegations made by Collins and researching the truth of the matters. It is the work of good citizens like Mike, Tea Partiers or not, that hold candidates and officials accountable to our American ideals. I applaud his work! As an ordained baptist preacher I would think that Doug would be held to even a higher standard of truthfulness than that of a lawyer. But I have known Doug for a long time, and this is not characteristic of him. I believe that these intentional misstatements must be from one of his handlers and not from Doug directly (although he alone is responsible for them). However, his State House votes that I don’t like were often “ordered” by “leadership.” But Doug did stand up in the Mike Evans DOT controversy against then-Speaker Glen Richardson and was punished as a result, so I know he can show courage. (The Hall County GOP Executive Committee passed a resolution applauding Doug, and I personally got a call from the Speaker’s Office complaining about it.) I expect my Congressional Representative to be courageous–even when it is unpopular. The issue now is what does Doug do about this book misquote gaffe, and what does this say about his ability to lead the 9th District? Unfortunately Doug affirmed the false quotes that he has published about Martha Zoller during the debate on August 18, 2012. The misquote was clearly presented to Doug, Martha asked the question, giving Doug the chance to come clean, but Doug held firm in his position. He had the perfect chance to do the right thing and show what kind of man he is–and he did. You can see the full video once it uploads to YouTube. Mike Scupin sent out another email AFTER the August 13, 2012 debate breaking down the latest Collins mailer. Once again Mike determined that the Collins allegations were, once again, completely without merit. 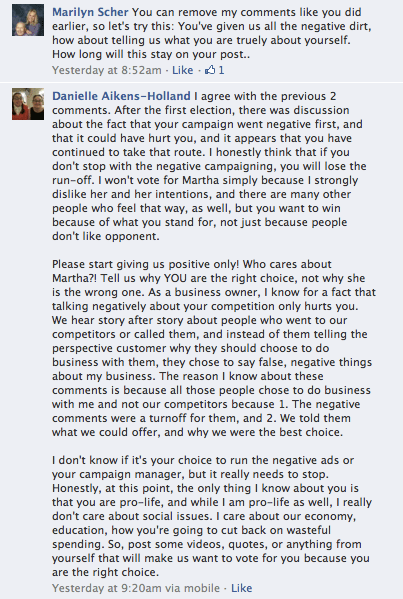 Doug is spending so much time on negative ads, even his own fans on FaceBook are complaining about it.